This old house, situated at2840 Cavell Ave., is the subject of many rumors. Was it a speakeasy? Was it a home to gangsters? What we do know is that it was built in 1912 by Leslie H. Fawkes, who had the first auto dealership in Minneapolis. He had come to Minneapolis from Illinois in the 1890s and opened a bicycle company in 1893. When automobiles came on the scene, he renamed it the Great Western Cycle and Automobile Co. and built the Fawkes Building at Harmon and Hennepin. Early in the Depression he went into the house trailer business as well. At one time, the house had seven bedrooms, seven bathrooms, three fireplaces, and several porches, one of which was 54 ft. wide. The house was made entirely of masonry – clay blocks, concrete and bricks kind of cobbled together – thus the name Cobble Crest. The grounds took in 60-80 fenced-in acres on either side of Minnetonka Blvd. The estate featured a deer pen, stable, trapshooting area, waterfalls, and statues. The property overlooks Cobble Crest Lake. One source says that Fawkes dredged and filled it, but it is still a lake. 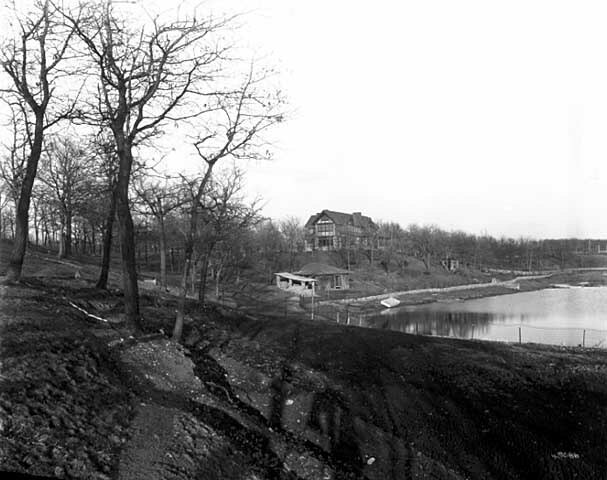 Notes from the 1970s tell us that the lake was shallow and murky, surrounded by black muck. One year it dried up and there were a bunch of 55-gallon drums in the middle. Unfortunately, the Depression won out, and Fawkes found he had to sell his country estate in the early 1930s. 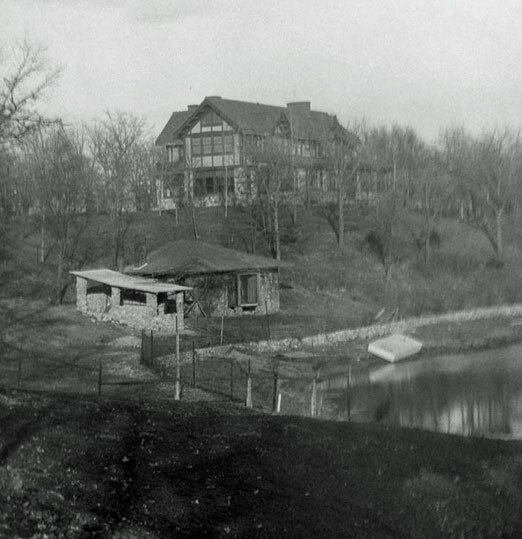 In the 1933 St. Louis Park directory it was listed as Cobblecrest Gardens (address 8800 Minnetonka Blvd), owned by George N. Rogers. At this point the estate became a hotspot for gambling, drinking, and dancing to live entertainment, brought in by one Howard Meagher. The managers were Mr. and Mrs. Howie Mayer and Don Berg. Marie Hartmann worked there for one day and declared the place to be a beer joint. Paul Udstrand tells us he heard that because of the nefarious activities, there was a need for a lot of electricity. Even though the property was far from the city and law enforcement, the owners needed to come up with an explanation, which was that the garage was rigged to recharge electric batteries for a Ford electric car that was being manufactured at the time. On October 17, 1955, Dr. H.A. Tinker and Dr. R.W. Cranston filed the plat to the Cobble Crest subdivision, creating 20 lots. Tinker was a dentist who was married to Cedric Adams’ widow. The homes in the new subdivision were built in about 1956-1958. At this time the lake may have been referred to as Tinker’s Pond. In January 1956, Robert Ridgeway requested permission to place a for sale sign at the property. 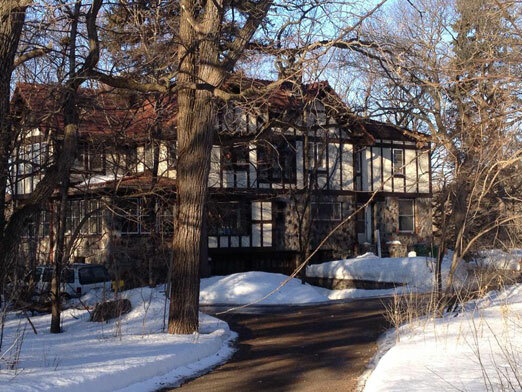 Ridgeway, who still lives on Cavell, reportedly bought all the property surrounding the house. He developed very nice size lots and built houses in which some original owners still live today. There are remnants of the old estate on several lots, including an old fence. Ward Hurd of C.L. Hurd Insurance Agency was the third owner of Cobble Crest, buying it in 1959. James J. McDonough, Jr. bought the property in 1976, and did (and is still doing) a great deal of restoration work.